What’s the highest grossing film about basketball in history? 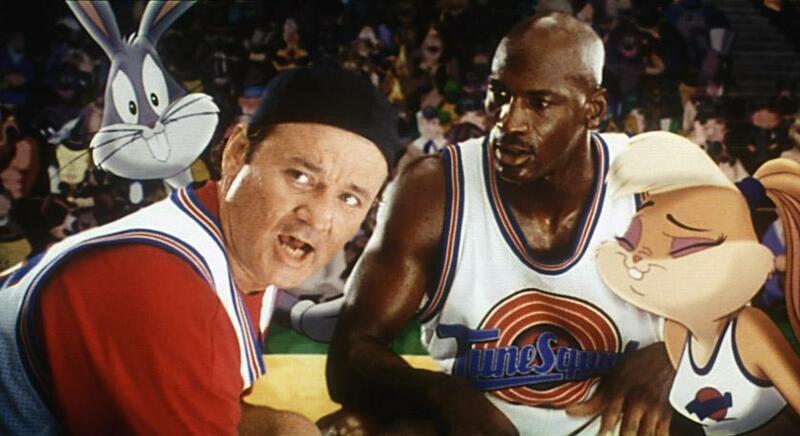 Ivan Reitman’s 1996 film, Space Jam, featuring the greatest basketball player of all time, Michael Jordan. Where were the greatest pick-up basketball games of all time played? On the set of Space Jam in 1995, on a custom-made indoor-basketball court built on the location of the studio where Space Jam was shot. Starring in the movie with 1992 Olympic gold medalist, Jordan, were his teammates on that Barcelona Dream Team, Patrick Ewing and Charles Barkley. Jordan had come out of retirement in 1995, but fell just short of taking his Chicago Bulls to the NBA Finals, which lost to the Orlando Magic in six games. According to this great ESPN article, Jordan wanted to make sure he was able to train hard and gear up for the following NBA season while filming Space Jam, so he asked for and got the construction of the indoor basketball court, dubbed the Jordan Dome. Jordan put out the word that he was looking for people to play in pick-up games, and the stars made a beeline for LA. In addition to co-stars Ewing and Barkley, all stars like Grant Hill, Rod Strickland, Glen Rice, Dennis Rodman, Juwan Howard, Shaquille O’Neal, Magic Johnson and Reggie Miller came to play some of the most intense shirt-skins matches ever. Michael Jordan, a man not satisfied with semi-final finishes, was determined to make sure these pick-up matches got him razor-sharp ready for the NBA season. According to the ESPN article, Don MacLean, a power forward for the Washington Bullets at the time, was being guarded by Jordan. MacLean got hot and scored the majority of his team’s points to help his team to victory one evening. MacLean had to leave town after that match, and Jordan came up to him and said, “Thanks for coming, make sure you come back.” MacLean thought that was cool of Jordan to say that, so he looked forward to coming back a couple of weeks later. Here’s how ESPN explained Jordan’s revenge. No one was more competitive, or more skilled than Michael Jordan in his prime. And therefore, no was better. Posted in Basketball, Other Olympics, Pop Culture and tagged 1992 Barcelona Olympics, Chicago Bulls, Dream Team, Ivan Reitman, Michael Jordan, Space Jam. Bookmark the permalink.